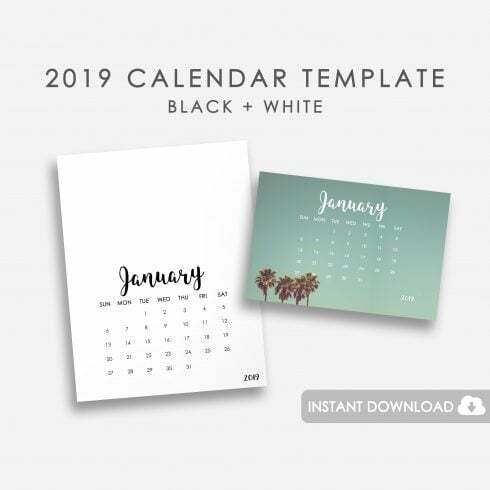 A 2019 printable calendar template to use however you like. 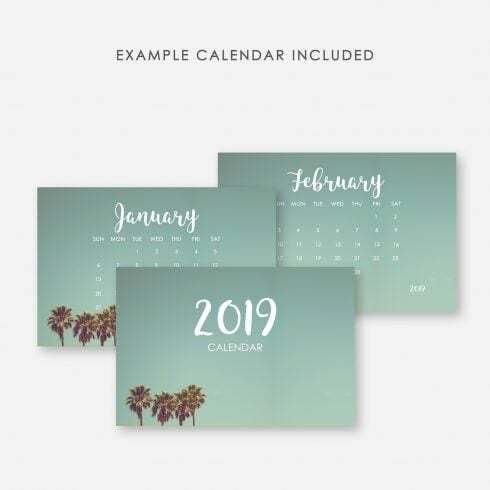 The calendar is perfect to use for photography and designs. Each and every artist, as a talented specialist, certainly can draw any image from scratch. It truly is unproductive, will take too much time. That is why the vast majority of designers use pre-made visual components – combine these graphic components, modify them and create the design with them. It is ineffective to purchase these elements as a stand alone, so that is exactly why they are put into graphic packages and offered as a singular solution. How can you spend less on deals? You can make the MasterBundles.com bundles even more affordable. Share this webpage in social media – you immediately get the 5% price reduction for the graphic packages you like. That’s a quite simple way to get a professionally designed tools for a lower price. Given that each of the package deals differ from one to another, every graphic designer will discover the required selection for a specific venture. Researching them you’ll find the selections including illustration swatches, social media infographics, PPT templates, and much more. On MasterBundles marketplace, there are actually over 450 graphic package deals to choose from. For what reason are graphic bundles cost-effective? The benefits of graphic package deals for web designers are usually pretty evident. But if you are a newcomer to them and now have concerns, the subsequent information will be useful for you. Including a multitude of the components within a single bundle, the selection provides you with an opportunity to use several of them for many different projects. On top of that, the price is usually greatly reduced which lets you save some dollars, yet get the complete set worth hundreds of dollars. Aside from graphic design deals, you may find a massive range of various other collections on MB. The packages of logo templates, icons and fonts are out there at your disposal. They deliver endless possibilities for the design of diverse projects. On top of that, you’ll find the full packages of WP design templates, courses and e-books, resume templates, ppt slides, and various other elements. How can you define a an infographics package? If you require infographics for a upcoming presentation in different businesses through social networking and marketing and advertising to medical care and schooling, the package is just the thing you were searching for. Making use of the infographics package deal you will find yourself saving your time which is crucial with regards to work efficiency. Each and every component comes in a separate file that may be modified in Photoshop, Illustrator, Keynote or Powerpoint. In the online era, many of us commit literally one half of our lives within social media networks like Instagram. It doesn’t matter what objective we attempt to achieve using this platform, we would like to stick out in a huge crowd amidst a large number of similar accounts. With high quality Instagram templates offered at MasterBundles.com, it’s not necessary to devote eternity while building the outstanding look of your Instagram page. The creative designers who like to work with photographs are going to be especially happy about the photo overlays graphic offers. The deals include selections of elements of design used to enhance and customize the photographs. Such kind of decorative elements is often placed over the photographs to produce some new look. MasterBundles has a substantial collection of bundles, packed with photo overlay items. What exactly is a watercolor package deal? The watercolor graphics package is usually a package made up of images and drawings painted with watercolors. They will perfectly come in handy for a variety of businesses, such as cosmetics, perfume and food distributors. Wedding stationery or cards may be designed with this bundle. Whether you feel as if you’ve lost lots of time when researching different resources and elements for your own graphic design jobs, it is high time to explore MasterBundles. This is a marketplace offering the hottest tools (graphics, icons, logos, presentations, fonts etc.) for web designers, entrepreneurs, and web developers at a reasonable price for a short period of time. In order to not miss significant information on the forthcoming promotions, we recommend reading our blog and subscribing to the newsletter.